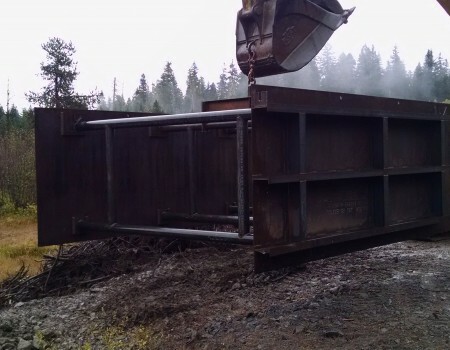 The patented* cofferdam system is a reusable cofferdam designed to withstand the toughest water diversion projects that demand a strong, effective, and safe coffer dam system. Cofferdams are typically used in the redirection/diversion of hydraulic energy such as water, in order to isolate an area for construction work and to allow workers protection from the surrounding body of water. Cofferdams can be subjected to many forces that can influence its design. This might include forces acting from water, large current velocities acting on the cofferdam, flooding and/or overtopping, floating debris such as logs, river bed topography, and seepage. Holding back and diverting water can bring a multitude of problems for different types of cofferdams. 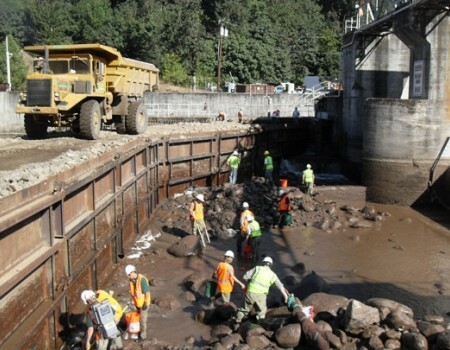 Onsite conditions affect every type of cofferdam differently. Rocky or an excessive boulder presence at the work site might cause complications for driven sheet piles and giant sand bag dams. While high velocity flows, which are multiplied in the event of a flood situation, can erode the foundation and sweep away earthen fill dams. The coffer dam system combines ingenuity, steel, and earthen materials to create a solid, resilient barrier. It is designed and engineered to withstand the most difficult demands. 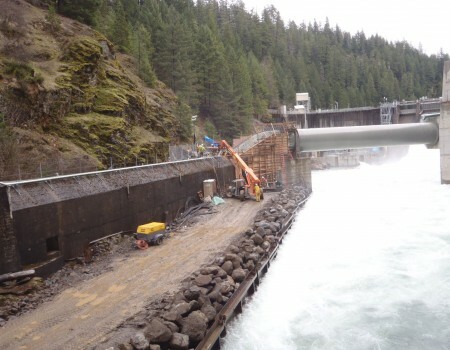 Our engineered coffer dam system has been put through the toughest tests, with standing high velocity flows, overtopping by flood events, and being battered by logs, while still maintaining structural integrity and function. Our system not only provides a safe working environment, it also serves as a construction access and working platform. The system has also successfully been subjected to overtopping by storm flood events of high velocity river water without failure. Our system can support large loading weights such excavators, cranes, haul vehicles and concrete trucks working on the top of the structure. Our cofferdam system provides additional feature customization to meet the specific demands of any project. Our cofferdam system is one of the strongest and safest systems in the construction industry, worldwide. It has been tested, installed and proven reliable on some of the toughest projects built on some of the most rugged terrains in the northwestern United States. This process typically requires a specific detailed consultation review of the project and its requirements, selection of the system components and options, preparation, delivery, installation, use, and removal. Please contact us for more information about our cofferdam system. Copyright © 2007-2016 Cofferdam, LLC. All Rights Reserved.